Look at the upcoming 2019 ESUG and Smalltalks Conferences, as well as Camp Smalltalk North America … and much more! Cincom founder and CEO, Thomas M. Nies, was recently featured as one of the 300 most power business leaders in Cincinnati. 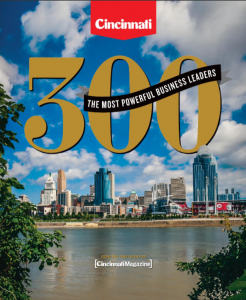 This special edition, which was produced by the publishers of Cincinnati Magazine, marks the publication’s first venture at ranking successful business leaders within the community. You can find the biography on Mr. Nies on page 57, and page 50 shows a full-page ad that features a special “thank you” to Cincinnati for 50 great years. To view the Cincinnati 300 publication, click here. Last month, we talked about how business leaders struggle with risk and how they can lower their risk by using Cincom Smalltalk. We also talked about using the 3X Methodology to help them succeed further in their planning. This month, we want to look at the process of understanding all of their business processes. The task of understanding and defining business processes is not a new concept. In fact, nearly eight years ago, we introduced a subject on our website called Business Process Analysis (BPA). BPA used to be considered as simply analyzing an organization’s current processes and designing a concept of it through a modeling tool, like the modeling tool in Cincom ObjectStudio. The goal of this concept was to deliver a working model of the necessary features for the benefit of IT personnel, since IT was where the proper system was created, tested and implemented to automate these processes. To see a demo of this using Cincom ObjectStudio, click here. In recent years, this predominate IT focus of BPA shifted to encompass the business user’s broader understanding and perspective of the overall business, shifting from the term Business Process Analysis (BPA) to Business Process Management (BPM). However, just a few short years ago, the concept of BPM was considered to be at a crossroads and was struggling to remain relevant due to how fast technology and business innovation was growing. But analysts were encouraged and positive that this struggle would change. In fact, in 2016, Forrester forecasted that BPM would continue to be a dominant and important force in the drive toward automation, collaboration and engagement. Forrester also predicted that as part of this drive, BPM practitioners would rapidly shift to a digital business transformation rather than focusing on business process transformation programs. Forrester went on to predict a strengthening in AD&D leaders’ investments and roadmaps as they strive for leaner BPM programs and software programs. How Can Cincom Smalltalk Help Me with BPM? As the need for process agility and digital transformation increases, Cincom Smalltalk is helping business users through various services and programs we offer our customers and partners. To learn more about what Cincom Smalltalk Services Partners offer, click here. SAP is an enterprise resource planning (ERP) software developed by the German company, SAP SE. SAP ERP incorporates the key business functions of an organization, which helps with business process management. For example, existing Cincom Smalltalk customers who have SAP requirements, as well as prospects looking for a solution that can work with SAP, can use Cincom Smalltalk and SAP NetWeaver Connect. What Is SAP NetWeaver Connect for Cincom Smalltalk? SAP customers can choose to do their functional enhancements with Cincom® VisualWorks®. SAP partners can close white spaces in SAP’s Business Application Map with certifiable applications created with VisualWorks. SAP NetWeaver Connect makes Cincom VisualWorks a “first-class citizen” in the SAP NetWeaver world. More detailed information about SAP NetWeaver Connect can be found here. How about a Real-World Example? Recently, Suzanne Fortman, the Program Director and Engineering Manager for Cincom Smalltalk, shared a story about a customer meeting at the Cincom Corporate Headquarters in Cincinnati, Ohio. This existing customer had been using Cincom Smalltalk for years and had five different applications written in Smalltalk. They had recently acquired another company and integrated a new team of Java programmers with their Smalltalk programming team. After the acquisition, their executive team gave both teams a challenge for building out a new solution. The requirement? Both the Smalltalk and Java development teams had to show a proof of concept and it had to connect with SAP. Since the STAR Team had a great relationship with this customer, they immediately called us to ask what we knew about SAP. We were able to introduce them to the SAP NetWeaver Connect application we described above. Since the SAP NetWeaver Connect application was written by one of our Cincom Smalltalk partners, we were able to ease the customer’s mind because we have an existing solution that can meet their SAP needs. The Java team, on the other hand, did not have the same shortcut to deliver the proof of concept to management with the SAP requirement. In recent months, we highlighted the value of Cincom SupportWeb® for Cincom Smalltalk customers. Today, we want to highlight the value of the Cincom Smalltalk Resolutions Newsletter. The Resolutions Newsletter is another benefit of being a Cincom Smalltalk customer and was created to be a useful tool in making it easier to do business with Cincom. However, the most important reason we publish the Cincom Smalltalk Resolutions Newsletter is to let customers know what’s going on with the product since the last release so they can see what resolutions might be available to them. If you are a current Cincom Smalltalk customer and are interested in receiving the Resolutions Newsletter, simply fill out the form on this page. Be sure to include your customer number, as only current Cincom Smalltalk customers have access to the Resolutions email. The purpose of the Hidden Gems Screencast is to give developers who use Cincom Smalltalk some valuable insight into the useful abilities of the products that may not be obvious. This Hidden Gems is about getting started with the “Next Generation User interface” (NGUI), which is used in Cincom ObjectStudio. Smalltalk users from around the world will be coming to Cologne, Germany to attend ESUG 2019. German software development company, ZWEIDENKER, will be hosting the conference, which will take place on August 26-30. ESUG (European Smalltalk User Group) is a non-profit association that gathers European users of all Smalltalk dialects. With goals of promoting the use of the Smalltalk programming language and communication between Smalltalk users, the association also helps in creating and linking Smalltalk user groups and representing Smalltalk users in discussions with vendors. This is the 27th ESUG Conference, and it promises to be one of the best in its successful history. This is the 13th year for the conference that focuses on Smalltalk-based technologies, research and industry applications. The Smalltalks Conference is one of the activities that is organized by FAST (Fundación Argentina de Smalltalk), which is an Argentinian non-profit foundation. With a mission to promote the use of Smalltalk in all areas regarding education, scientific research and professional development, FAST seeks to connect Argentina and the region with the international Smalltalk community. We look forward to seeing you at Smalltalks 2019! Calling All Smalltalk Enthusiasts in North America! Interested in Smalltalk on IoT devices, programming language design or tooling? What about Smalltalk on web frameworks, virtual machine implementations and data processing applications? If you’ve never heard of Camp Smalltalk or have never had the chance to attend one, it’s your opportunity to meet and engage with a passionate community of folks interested in Smalltalk programming. Camp Smalltalk is an open community that enjoys sharing ideas and listening to new ones … and everyone is welcome!